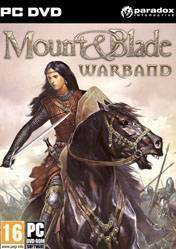 Mount&Blade: Warband is the first sequel for the action role-playing video game Mount&Blade.The new multiplayer mode removes all of the RPG and map elements from the single-player mode, instead focusing on direct combat. Multiplayer matches cater for up to 64 players, split into two teams based on the kingdoms selected. All players are provided with a balanced \'template\' character (which can be altered for each server) based on three general types: Archer, Cavalry, and Infantry. Characters are customised by purchasing the equipment available to their selected kingdom, with better equipment purchased after earning denars (the game\'s currency) in the multiplayer matches. One of the best medieval games I've ever played. Just Native alone is amazing as singleplayer so is multiplayer. Plus you can get Napoleonic Wars and Viking Conquest expansions with it which expand the experience even further. In my opinion one of the best games ever made. I've had so much fun playing this game. The mods out there (like diplomacy mod, viking conquest etc) are game changing. one of the best price/quality games ever. a must have. this game is amazing!, i like the full invasion mod ! This game is quite amazing, especially the DLC Napoleonic Wars.